We just wanted to take a moment to thank you for your continued support throughout the years. We wouldn’t be where we are today without your help! It truly brings us joy to help you make your real estate dreams a reality. If you have any questions, please don’t hesitate to reach out to us. We are here to help you in any way we can. These 10 home renovations may sound great to you, but they won’t necessarily add value to your home. 1. A swimming pool. Obviously, you won’t get your money back on a swimming pool in Fairbanks. If you add an outdoor hot tub or jacuzzi tub, you won’t add value either. The buyer may see value in the hot tub or jacuzzi, but you won’t get your money back. If you do want an outdoor hot tub so that you can sit out there and look at the stars, then get one because you’ll enjoy it, not because you expect to sell your home for more money. 2. Over-renovating for your neighborhood. It’s true that you don’t want to be the nicest house on the block. Don’t overdo it. If you do, you’ll get nailed on property taxes and you probably won’t get all the value back when you go to sell. 3. Extensive landscaping. Landscaping will often be covered by snow, so upkeep on extensive landscape projects can be difficult. Appraisers only give so much value to outdoor improvements, so be careful. When someone comes to me and says that they spent $50,000 on the backyard, I think, “Oh no, that’s not good.” Don’t do that. Check with us first. 4. High-end upgrades. You don’t need any gold-plated faucets in your house. It’s not worth it. Keep upgrades to the middle of the road. 5. Wall-to-wall carpeting. Wood floors are great. Investing in carpet is fine if you’re replacing carpet, put don’t put carpet everywhere. Vinyl flooring may be better in some cases. 6. Invisible improvements. This goes against a lot of other people’s advice, but replacing something like a boiler won’t necessarily get you all of your money back. If it’s working fine, leave it and let the buyer replace it with something that they like. If you’re looking to replace a boiler for $20,000, you’re not going to sell your home for $20,000 more. 7. A well-decorated or remodeled basement may look great, but keep in mind that subgrade square footage is valued less than above-grade square footage. The only caveat to this is if you plan on adding a bedroom to the basement. Again, reach out to us with any questions before you start renovating. We can definitely guide you there. 8. Building or upgrading a deck. Again, external improvements are not valued as much as indoor improvements. If you are going to do external improvements, either do the work yourself or find someone who will take care of it for a reasonable price. Only do it because you will enjoy it, not to add value to your home. 9. Patio or playground equipment. Like the deck, only invest in these items if you will get enjoyment from them. 10. Adding a carport or expanding the garage. Due to the cost of building these things in Fairbanks, you won’t get a dollar-for-dollar return. Only do this renovation if you will enjoy it. If you would enjoy a renovation or upgrade, you can still do it—just don’t expect a dollar-for-dollar return. Ultimately, many of these renovations will not increase the resale value of your home. However, if you plan on staying in the home for a long time and you want to enjoy some of these improvements, you can still make them. Many of these renovations will improve the marketability of your home without necessarily increasing its value. If you have any questions about increasing your home value or anything else in real estate, just give us a call or send us an email. If we use your question on our video blog, we’ll send you a $20 gift certificate. We look forward to hearing from you! If you’re curious about becoming a real estate investor, here are five ways that you can get started. Today we’re going to be talking about five ways you can invest in real estate. Buy and rent. This is probably the most traditional way to invest in real estate, and it simply involves buying a property and renting it out. Now is a good time to do this because rental rates are on the rise. They’re up 8% from last year, which is pretty good if you’re looking to invest this way. Buy and sell. This is typically called “flipping.” Home flipping offered a record-breaking 49% return in 2016. Mind you, this is a national figure and won’t necessarily be the case in any particular local market. Contact your real estate professional to determine the climate of your particular market. Real estate investment groups. These are organizations that buy a set of properties and sell them to individual investors. The main benefit of this approach is that you typically do not need to act as a landlord because the investment group handles property management for you. Crowdfunding sites. There has been an explosion of these sites in recent times. They allow people to invest in various real estate development projects. You can be a part of a large-scale property by only investing a moderate amount of money. On the other hand, crowdfunding sites act as a middle-man and charge fees which will eat into your profits a little bit. REIT (real estate investment trust). REITs are like mutual funds for real estate. They typically pay high dividends; however, they do not offer all of the typical benefits of investing in real estate such as increased leverage and tax benefits. Each of these investment approaches offers a trade-off between possible profits and costs. The one constant is that you can maximize your risks with due diligence and by consulting with an experienced real estate professional. Each of these investment approaches offers a trade-off between possible profits and costs. If you have any questions or ideas about a future topic to discuss, please feel free to call or email me. If we use your topic for a blog, we’ll send you a $20 gift card to a local vendor. Should you sell your home FSBO? Here are a few things to consider before you make the decision. Pro: You’re in control. You get to make the decisions on pricing, marketing, staging, and everything else. You make the final say. Con: Criticism. Dealing with criticism and rejection is part of a real estate agent’s life. Are you prepared to take that criticism on as well? Do you even want to? Pro: The trust factor. Do you know which buyer’s agents to trust and which to avoid? A professional real estate agent does. Con: Objectivity. Will you be able to see your home through the eyes of a buyer? You may think you have a neutral perspective, but you have so many emotions and memories wrapped up in the home, which means being objective is going to be a challenge. Will you be able to see your home through the eyes of a buyer? Pro: You already have the knowledge. If you have prior real estate and/or marketing knowledge, you can put that to good use without having to hire someone else to do it. Con: Having real estate sales expertise. Real estate sales is different from any other business I’ve ever heard of. There are a lot of nuances, especially in the Alaska market, that you need to be aware of in order to have success. Pro: No commission fee. That’s probably the biggest reason you’d want to do this on your own anyway. Con: Slower sale. If you want a slower sale with a few possible price reductions sprinkled in, be my guest and try to sell on your own. As you can see, there are plenty of pros and cons to selling your home on your own. If you want your next sale to be successful, profitable, and convenient, don’t hesitate to give me a call or send me an email. I look forward to hearing from you soon. If you’ve put your home on the market and it’s currently vacant, there are seven things you should do to it to prepare it for winter. Let’s be honest—we’ve got snow coming. If you’ve got your home on the market and it’s currently vacant, there are seven things you need to do to prepare it for winter. 1. Give a key to a neighbor or friend who’ll be checking in on the property. Neighbors are usually the better choice in this regard because they’re in close proximity to the house. If something happens to the heating system and it’s 20 degrees or colder out, you only have about 24 hours before you lose the whole house. 2. Have the home winterized by a professional. This goes without saying. It might cost anywhere from $500 to $1,000, but how much will it cost you if the house freezes up? 3. Add glycol to the heating system. This is something you should discuss with your boiler professional so they can advise you on whether or not this is a good idea, but glycol will at least keep your home’s pipes from bursting. Adding glycol to your heating system will help keep your home’s pipes from bursting. 4. Purchase or install a free alarm or a home monitoring system. There are a couple different things you can do with a freeze alarms. Some you can simply plug into the wall with a thermostatic switch and a light to notify your neighbor in case the temperature gets too cold. You can also get a Sensaphone. If you have questions about which one to buy, just email me and I’ll send you information about the one I like to use. 5. Get your boiler cleaned and serviced by a professional. We have some great vendors we can recommend to get this done for you. 6. Set your fuel on “autofill.” I can’t tell you how many times I’ve had sellers let their houses run out of fuel and let them freeze up. 7. Advise any other companies with accounts or services related to your home that it will be vacant and on the market, including your insurance company. With a lot of policies, if you don’t let them know after a month or two that your home is vacant, your insurance won’t cover it if something happens. If you have any questions about preparing your home for the winter or you’re thinking about buying or selling a home, don’t hesitate to reach out to me. I’d be happy to help you. We’ve got an extensive real estate market update for you today. Here are all the numbers you should know. I’ve got a lot of great information to share about a few different markets here in Alaska today. For the quick hits, if you go to our home page and scroll down a bit, you’ll see them. There are stats for the Fairbanks, Anchorage, North Pole, and Mat Su Valley markets on there. If you want a deeper dive, click on the “more” tab on the top of the page, where we post our weekly market trend reports. I reference them a lot in our radio show, so I invite you to download them and follow along on our next episode. The discrepancy between homes that sold quickly and homes that didn’t is clear. It usually comes down to pricing the home right, conditioning it right, and marketing it right. Time is money, and the statistics show that. Overall, we’ve got a balanced market in Fairbanks trending toward sellers. With a pending ratio of 35.2%, I call this an active market. Fairbanks is a very active market right now. Finally, I want to talk about the trends we’ve been seeing across the entire market. As far as units sold goes, we dropped a little from 101 to 96, but that's not too much to be concerned with. We saw a jump in the median price, from $221,695 to $226,325. Obviously, we’ve gone through a lot of information. The crazy thing is that we have barely scratched the surface. If you have any questions or would like to have these numbers explained in further detail, we’d be happy to help. Give us a call or send us an email today and we’ll be here to help. "First of all, they sold my house very quickly at a fair price. They did all the legwork so I really was able to go to work and focus on what I needed to focus on in my life. They helped me buy a new house and they managed to coordinate both the sale and the purchase of my new house all on the same day. On one occasion Greg Merdes came out at 26 below zero to find the waste vents for our septic system because my husband was unable to do it. And so Greg borrowed his equipment from someone, came out, dug around, and found the waste vents and marked them on his own time and on a Sunday at 26 below zero. He did not have to do that." Oh No, My VA Appraisal Came in Low! Low appraisals are bad news for everyone, but the process is a little bit more complicated for veterans. Luckily, you do have a few options. What do you do when your VA appraisal comes in low? Low appraisals are the bane of my existence. First, though, it’s important that you know about the Tidewater Initiative. Your lender or buyer’s agent will let you know when the appraiser invokes tidewater. This has nothing to do with floodplains or your ability to purchase the home. The Tidewater Initiative simply means that the appraiser believes they will come in low on the report. Through the Tidewater Initiative, you will know ahead of time. The agent then has 72 hours to provide additional comps in order to help the home come in at the agreed-upon value. Once the appraiser completes their report, they’ll submit it to the VA. The VA will underwrite the appraisal and issue your notice of value, or N.O.V. That’s when we know what the value is and what kind of financing the veteran can obtain. If the notice of value is lower than the contracted purchase price, then we have a problem because a VA loan needs 100% financing. At this point in time, your agent can request a reconsideration of value. There is a formal process for this, but basically the reconsideration of value checks to see if the appraiser made any mistakes or miscalculations. After all, appraisers are human and humans make mistakes. Realtors put information into the MLS and it’s up to the appraiser to decipher it; mistakes can be made. Your agent can request a reconsideration of value. During the reconsideration of value, we may also find other comparables in the report that weren’t initially used to justify the purchase price. There are no guarantees that the reconsideration of value will actually work. You need solid evidence to support the case. I’ve done a few of these successfully, and the biggest one was a $10,000 upswing. I had to find photos, comparable sales, and have the buyer write a letter. It can be a lot of work to get those reconsiderations through. Ask the seller to lower the purchase price. As the buyer, you are protected by the VA loan. You can get out of the deal and get your earnest money back if the seller doesn’t agree to lower the price, which kind of forces the seller’s hand. Make up the difference in cash. You and the seller can meet in the middle or you can make up the difference on your own. If you are able to put up to 5% down, you can lower your VA funding fee. You can walk away from the deal. Unfortunately, you may have lost some time, energy, and money on things like inspections during this transaction. On the bright side, your earnest money is protected. A low VA appraisal can be a disastrous surprise, so make sure you work with an agent who is trained in VA loans and can perform a market analysis prior to making an offer on the home. Your agent should also know the reconsideration process. Wes Madden and Dar Walden are together today for a special announcement. You might be wondering why I'm joined by my colleague Wes Madden in today's video. We actually have some exciting news to share: The Dar Walden Team and Madden Real Estate, two of the top real estate teams in Alaska, are merging! To put that into perspective, last year we served a combined 778 clients with almost $200 million in sales volume. The best part is that Madden Real Estate will be part of the Keller Williams group, the world's largest franchise that has more than 150,000 agents and 800 offices around the world. We teamed up so that we could provide our clients with true statewide service, making us the only team that serves all of Alaska. Our website is actually your only broker-owned source for all Alaska MLS listings. We also have a worldwide referral network. If you're moving out of state, we can take care of any and all of your needs thanks to our network of 150,000 worldwide agents. The merger also adds even more horsepower to our proven marketing systems. The merger also adds even more horsepower to our proven marketing systems. You might already know that we have some of the most progressive and exciting marketing strategies, and our merger will let us have synergy between all of our ideas and campaigns. We also share many of the same endorsements, including Barbara Corcoran, Glenn Beck, and Gary LeVox from Rascal Flatts. We also share a lot of core values; this whole deal simply wouldn't work if we didn't. Having a team with two people that carry the same belief system is truly an amazing thing. So if you're interested in buying or selling a home here in Alaska or you're interested in a career in real estate, just give us a call or send us an email. We'd love to hear from you! Madden Real Estate has merged with the Dar Walden Team. This merger benefits our present and future clients in several ways. 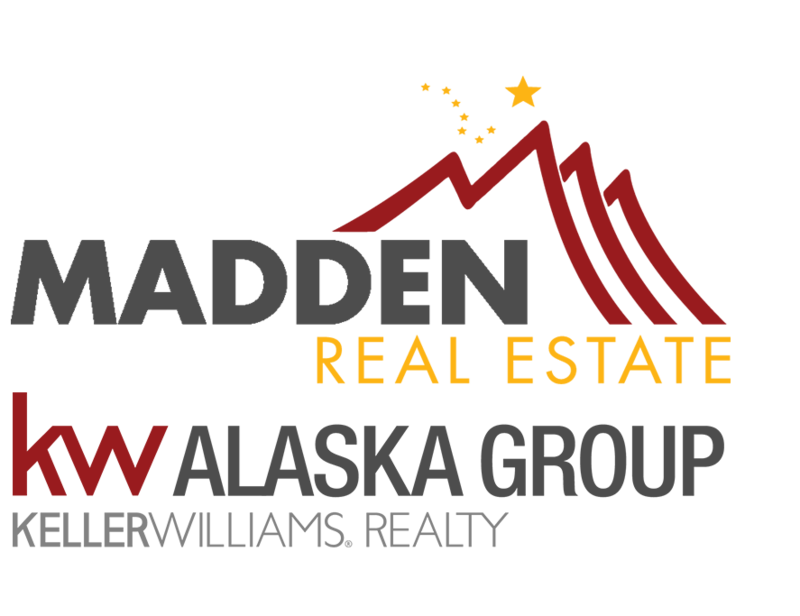 Today I’m very excited to announce that Madden Real Estate has merged with the Dar Walden Team out of Anchorage. What does this merger mean? To put it into perspective, in 2016 our two teams served a combined 778 clients for almost $200 million worth of sales production. This also means our team will join the Keller Williams network. Keller Williams is the world’s largest real estate franchise, with more than 150,000 agents worldwide in 800 different offices. This expansive network was something that I saw great value in, and there were several reasons we decided to join it. First, it gives us true statewide coverage for our clients. We are now the only team who has ever served all of Alaska, and we can help any client who has to move all the way across the state. This capability is something I’ve been particularly excited about, and I’m glad we’ve finally been able to realize it. This merger also gives us more horsepower for our proven marketing system. Now that we’re connected to 150,000 other agents, we can use this new referral network to create even more buyer demand for our clients’ properties. Also, if you’re a seller and you have to leave the state, we’ll be able to pair you with a top-notch agent in whatever market you’re moving into. By the way, Dar Walden is also endorsed by Barbara Corcoran. I can’t wait to have some fun shooting some TV commercials with her! With this merger, we’ll be able to service our clients even better. Last but not least, our teams share the same core values. I’ve known Dar and Ed for a long time, and I can’t think of two better people to be in business with. It’s one thing to be in business with someone; it’s another thing to share the same business ethos with them. That was very important to me in continuing the Madden Real Estate legacy. I will still serve as the CEO of Madden Real Estate for the foreseeable future, so you can rest assured that you will still receive the same extraordinary service from us that you’ve grown accustomed to. If you have any questions, please don’t hesitate to give me a call or send me an email. I’d be glad to help. Do Appraised & Assessed Values Impact Market Value? What is the difference between assessed and appraised values? How do they impact the market value of your home? I’ll go over everything you need to know today. Thanks for your question, Daniel! A $25 gift certificate is coming your way. Now, there are three different types of values in real estate: assessed value, appraised value, and market value. The assessed value is used by your bureau, county, or municipality to determine your property taxes. The assessor uses common appraisal tactics such as neighborhood drive-bys, recorded sales (although sales price is not on the public record in Alaska—we use voluntary sales information), and property tours. In Alaska, you will get a notice in the mail asking you what you paid for the house and what kind of financing you used. This is voluntary information; you don’t need to fill out the form and you don’t need to invite the assessor into your house. However, if you think your assessed value is too high, it can help to have established communication with the tax assessor. The assessor takes that value, multiplies it by the mill rate for your area, and subtracts any tax exemptions in order to determine your tax obligation. The appraised value comes into play when you finance your home purchase through a mortgage. The lender will hire a third-party appraiser to determine the value of the property. The appraiser is the eyes and ears for the mortgage lender; they mitigate the risk for the lender and justify the contract sales price for the loan. Since the Dodd-Frank Act, there have been many changes in this process and a push to make those appraisals more conservative. As a result, appraisals rely more on an equation rather than local market knowledge; that math problem doesn’t always work because you might be comparing apples to oranges. The market value of your home is dictated by market conditions like supply and demand and the condition of your home. The market value also depends on your listing agent’s negotiation skills. Both the assessed and appraised values have impact on the market value. However, the appraisal has much more bearing on market value, especially since 90% of home sales are financed by a lender. The appraised value has more of an impact on your market value. If an appraisal comes in low, the buyer has the ability and leverage to negotiate the sales price to a lower value. In many cases, the appraisal sets the market value. If you have any other questions, send me an email. If I answer your question with a video, you will receive a $25 gift certificate. Please don’t hesitate to reach out to me. I look forward to hearing from you! What Happens to Earnest Money When a Deal Falls Apart? When a deal falls apart, what happens to the earnest money? We’re going over that exact situation today. Today we are answering a question from VIP client Rick Swanson. He asked, “What happens to my earnest money if my home sale falls through?” That’s a great question, Rick. We’ve got a $25 gift card coming your way. Now let’s get to the answer. Obviously, this isn’t the ideal situation to be in. Let’s start at the beginning. Earnest money is a good-faith deposit that a buyer makes when they write an offer on a home. This is the consideration at stake that makes the contract valid. This sum must be secured in the form of wired funds, a certified check, or a personal check. Cash won’t work for the bank. Now, the purchase and sale agreement details the obligations for both buyers and sellers. When one party doesn’t perform their obligation, we can get to a point where the buyer and seller agree to disagree and the deal falls through. When this happens, we execute a rescission agreement. This requires both parties to agree on earnest money disposition. We identify why the deal is falling through, where the earnest money goes, and make sure all bills are accounted for. Unpaid bills are usually taken out of the earnest money. 1. The broker holding the earnest money can dictate the disposition of the earnest money and decide who they want to give it do. 2. Mediate internally. This is the method I prefer. 3. Hiring a professional mediator to work with both parties to come to an agreement. 4. Hiring an arbitrator to give a binding agreement for the disposition of the earnest money. 5. Let the buyer and seller duke it out in a court of law. A good Realtor should be able to help you avoid this type of situation by setting realistic expectations and staying in constant contact. If you do get into a situation like this, however, they are the best people to help you out. If you have any questions for us, don’t hesitate to reach out to us. If we pick your question, we’ll send you a $25 gift card, too. I look forward to hearing from you.